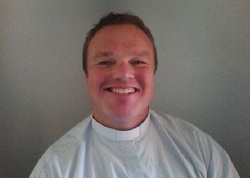 I am Daryl a happily married father of three, and Anglican priest living in regional New South Wales Australia. I am eager to share the Word of God with as many people as I can reach and the web seems like a platform to achieve this. I came to faith later in life, having grown up in a family where my exposure to Christianity was largely limited to attending weddings and funerals. It was when I was 21 that I finally found faith after having had an experience in a book store where I had the overwhelming compulsion to buy a Bible. I did, and from that moment on my life began to change. My first experiences of faith were in the Roman Catholic Church, and it is in that Church that I truly found Jesus for the first time. Eventually however I began to struggle with some doctrines espoused by the Roman Catholic Church - especially those around Papal infallibility and the immaculate conception of Mary (not to be confused with the virgin birth of Jesus). When my wife and I married, I had effectively left the Roman Catholic Church, but I was still catholic. We found the Anglican church was a happy compromise for us in terms of worship style, (My wife having come from an evangelical background) with a happy mix of relaxed worship and emphasis on scripture, along with a catholic understanding of the role of the sacraments and due reverence for the Eucharist. In terms of my place on the wide spectrum of Anglicanism I describe myself as an Evangelical Anglo Catholic. I am also somewhat on the Charismatic side, believing in the gifts of the spirit. To explain this hybrid belief structure let me put it this way - I am catholic in that the sacraments are integral to my faith, especially the Eucharist where we experience the true presence of Jesus among us. I am evangelical in that I am passionate about the importance of scripture and the study of God's Word, and about spreading the news about the gift of salvation as far and wide as I can. I am Charismatic in that I accept that the gifts of the spirit are alive in the Church, including tongues and prophesy - though I don't accept the widely held view among the charismatic movement that Tongues are always the first sign of receiving the Holy Spirit.